The so-called Islamic State has said it carried out a gun attack in Dagestan, southern Russia, that left one person dead and 11 injured. 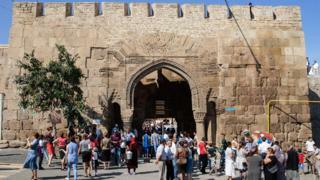 Gunmen opened fire at the Derbent citadel, a Unesco World Heritage site in the North Caucasus, on Tuesday evening. A statement posted to IS's main channel on the Telegram messaging app said the attack had targeted Russian intelligence agency officers. The gunmen fled the scene. Moscow is fighting an Islamist insurgency in the mostly Muslim North Caucasus, with attacks commonly occurring in Dagestan. State news agency RIA has reported that one Federal Security Service (FSB) member was killed and another injured in the shooting, quoting anonymous sources. The citadel in Derbent, one of Russia's oldest cities, is considered a tourist site. It was listed by Unesco in 2003. IS established a franchise in the region in June, and in September claimed responsibility for an alleged attack on a Russian army base in southern Dagestan. The al-Nusra Front, an al-Qaeda linked group active in Syria, had called on jihadists to organise attacks in Russia in retaliation for the country's bombing campaign in support of the Syrian government. Russia has been bombing IS and other groups it considers terrorists, some of which are backed by Western powers. On Wednesday, the Russian military said it flew 121 sorties over Syria in two days, hitting 424 targets. Nearly 2,900 Russians have travelled to Iraq and Syria to fight alongside militants, according to the FSB.